Position a rack in the middle of the oven. Heat the oven to 300⁰ F. Line an 8 x 8 brownie pan with heavy aluminum foil, letting the foil extend over 2 sides of the pan. Sift the flour, cornstarch and salt into a large bowl. Add ½ cup of the superfine sugar and with a mixer on low, mix to just blend the ingredients. Add the butter pieces and vanilla and mix until large (1/4-1/2 inch) crumbs form, about 2 minutes. Very gently press the dough evenly into the prepared pan. Don’t pack it. Bake until the top of the shortbread just begins to turn golden, about 1 hour and 10 minutes. Remove from the oven and immediately sprinkle the top with the remaining 2 TBP of superfine sugar. Cut the shortbread into 12 squares, making sure to cut through to the bottom. Cool completely before lifting the foil out of the pan. Serve with curd, if desired. 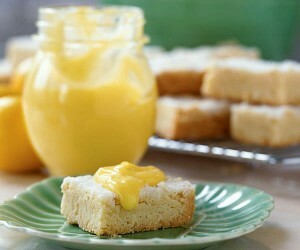 Lemon Curd is not the easiest thing I’ve ever cooked, but it is one of the most delicious. I normally make it with limes simply because I prefer their fresh flavor. In a large bowl, beat the butter and sugar with an electric mixer, about 2 minutes. Slowly add the eggs and yolks. Beat for 1 minute. Mix in the juice. The mixture will look curdled, but it will smooth out as it cooks. In a heavy saucepan, cook the mixture over low heat until it looks smooth. Increase the heat to medium and continue cooking, stirring constantly, until the mixture thickens, about 15 minutes. Keep a close watch, stirring, especially if you have an electric stove. When ready it will coat a spoon and read 170⁰ F. Don’t let the mixture boil. Remove the curd from the heat and stir in the zest. Transfer the curd to a bowl and press plastic wrap on the surface to keep a skin from forming. Chill. It will thicken further as it cools. Cover tightly. Refrigerate up to a week or freeze for up to 2 months.